This is a moder version of a Vintage Advertising Trading Card. 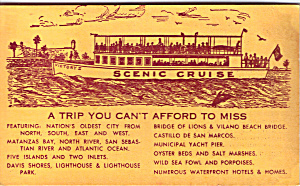 From St Augustine, FL it advertises Scenic Cruises of the Waterfront and Matanzas Bay aboard the Victory II. Estimated date is WWII Era as it has a sericemans rate listed. In good condition it is 3 x 5 inches.